Slovenia has already westernized quite a bit, although there still is one big difference with northern European countries: public transport. The public transport that is available is good and fast but there's basically only transport available from and to Ljubljana. And it's very infrequent. Going from Bled to the Postojna, in the south west, meant traveling for most of the day and going through the capital. Waiting just outside of the Ljubljana train station for my connecting train onwards, I woke up with two espressos while an aging couple were already drinking half-liter beer mugs. Close to Postojna, a number of locations are worth visiting: Two extensive cave structures, the Postojna and Skocjan caves, a castle in what is probably the most spectacular location in the world and a lake that, most of the time, isn't really a lake. 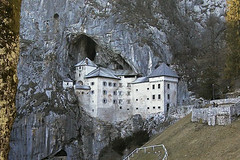 The Skocjan caves are said to be the nicest of the two but they close for the winter. The train that drove me into the Postojna cave clearly was built with summer crowds in mind. At no less than 40 meters it could ferry 100s of people into the cave at the same time. The entrance fee made clear it came close to being a tourist trap. Caves never really impress me but I figure I didn't really have a choice in visiting this one. At no less then 12 euros I got to see everything a self-respecting cave should have on offer: Stalagmites, stalactites, spaghetti-rocks, beautiful colors and phallic-, turtle-, Yeltsin- and wrestler-shaped rocks. The cave does have one bonus, the Proteus Anguinus, also called the 'human fish'. It's a cross between a salamander and an eel and during the dark ages, people thought this 30cm long creature was in fact a baby dragon. In a water tank on your way out, every couple of months, new fishes are put in the tank as the old ones are set free. Walking past some farm land when going to the cave from the Postojna train station, I past pear trees where, on the branches, bottles had been put around the growing fruits. When the pears are full grown, the bottles are harvested and filled with pear liquor. As in Ljubljana, it's difficult to find accommodation in Postojna during winter although with only 800 souls, that isn't that surprising. And if you don't have your own transport, it's difficult to see the sights in the area. I was lucky; through a roommate of mine, I had gotten to know Mateja, on whose couch I spent two nights and who, lucky me, drove me around the area. The castle of Predjama, built on the outside of a cave entrance is stunning. The Cerknica lake, a grassy area on top of a porous cave system only becomes a lake when the underlying cave system over fills with water, say after melting mountain water fills the local streams. Within hours the area floods, sometimes covering the nearby villages. Cerknica is what is called a 'polje'. 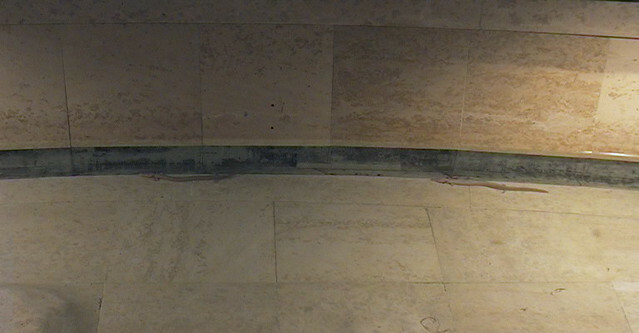 In less than a day, it can flood an area of 40 square kilometers. Mateja is a teacher, which meant she had to be at school at 7:30. Terrible, although not totally inconvenient. It meant I had to leave early for my next stop, on the coast. We had checked my departure time the previous day and only minutes after her starting her class, I could be on the coast bound train to Koper, from where I would travel by bus to Piran, a small Venetian town with twisting and turning cobbled streets. When I arrived at the train station, it turned out we had been misinformed. The next train left at 10:22. 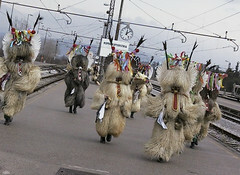 During winter, only two trains a day run from Ljubljana to the coast. A nap then. When I was traveling from Lindau to Feldkirch, on the Austrian/Swiss/Liechtenstein border, I had shared a compartment with people celebrating carnival. All wearing the same clothes, with huge, over-proportioned masks. Here, on the train to Koper, they came from Ptuj, in the north east of Slovenia. All were dressed in sheepskins with grotesque masks, cow bells around their waist and pitch forks to scare away the devil. Koper was hosting some sort of carnival conference. In retrospect, I was reminded of these costumes when, 18 months later, I spent four months in Mongolia. 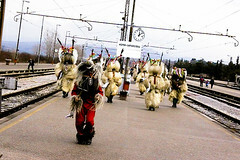 There, Tsam dances are performed to scare and entertain the spirits as part of their shamanistic beliefs. 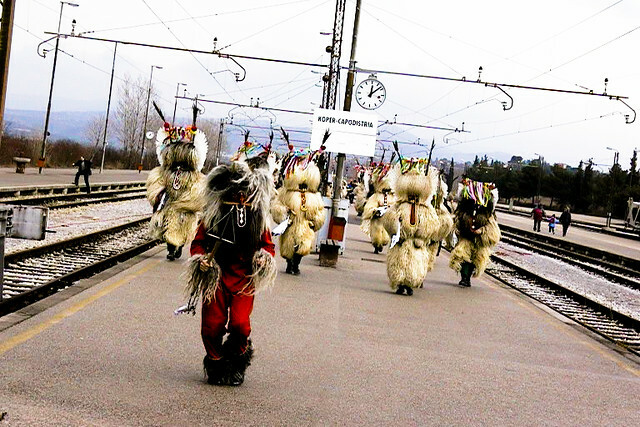 When I got of the train in Koper, media, police and party goers were welcoming their guests from Ptuj and they were given due respect in the shape of an impressive show. With lots of noise and dancing, they succeeded in making my day at least. 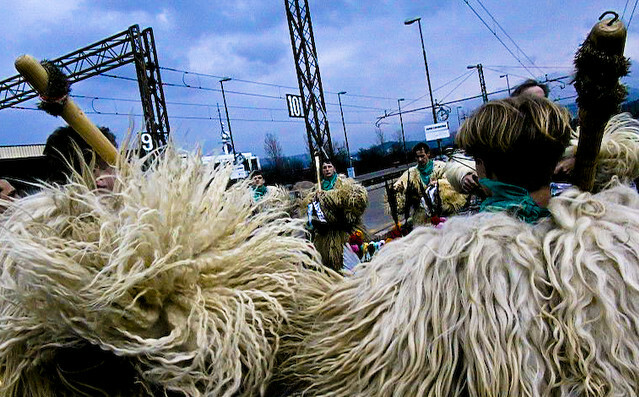 Normally, these activities are done at the 'Kurentovanja', celebrating spring and fertility. In Mohï¿½cs (Hungary), Serbia and Bulgaria, similar festivities take place each year, although the party in Ptuj is said to be the biggest. 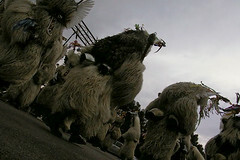 The sheepskin suits represent 'Kurent', the god of fun and joy. The masks have a huge tongue, hanging on their chests (hmmm, what do *you* think they do with *that*) and they are led by a 'hudiï¿½', a devil, with a fishnet, for catching willing souls. At a real party, young girls offer handkerchiefs to the party goers and spectators throw clay pots at the feet of the Kurents for good luck.